– Star-Lord, a.k.a. Peter Quill, comes with interchangeable masked and unmasked heads, two Element Guns that can attach to his hips, an interchangeable hand that can hold a stolen crystal, and a pair of boot-jet flame effects, which can plug into the soles of his shoes. He also comes with a sculpted diorama piece, as well as a flight support stand. 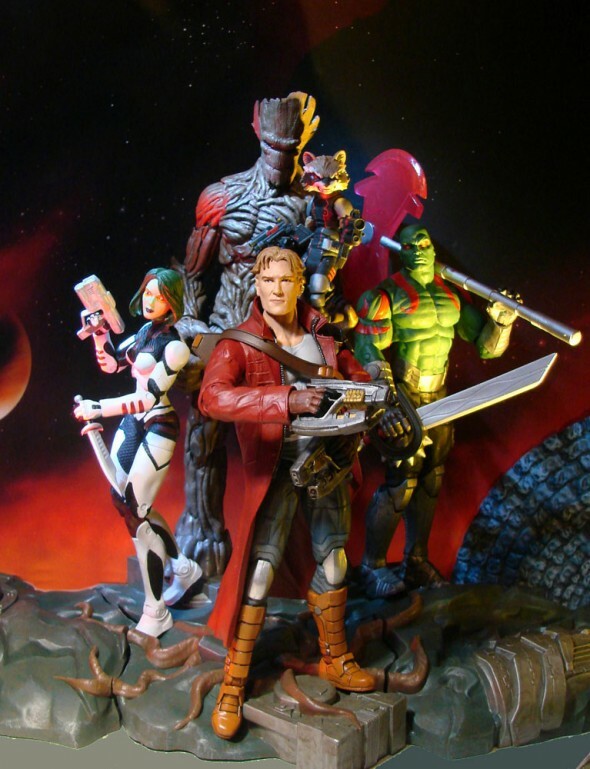 Star-Lord features 16 points of articulation and stands approximately 7.25 inches tall. He was sculpted by Jean St. Jean. 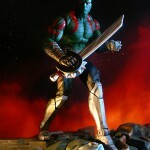 – Drax the Destroyer comes with six interchangeable open, gripping and fist hands, a trench knife with a spiked knuckle guard and a large energy axe. He also comes with a sculpted diorama piece. 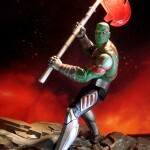 Drax features 16 points of articulation and stands approximately 7.5 inches tall. He was sculpted by Gentle Giant Studios. – Gamora and Rocket come packaged together. Gamora comes with interchangeable fists and gripping hands, plus a sword, knife, laser rifle and two laser pistols; Rocket comes with two blasters. Gamora stands approximately 6.75 inches tall and Rocket stands about 3 inches tall; each features approximately 16 points of articulation. They come packaged with one piece of the diorama base. 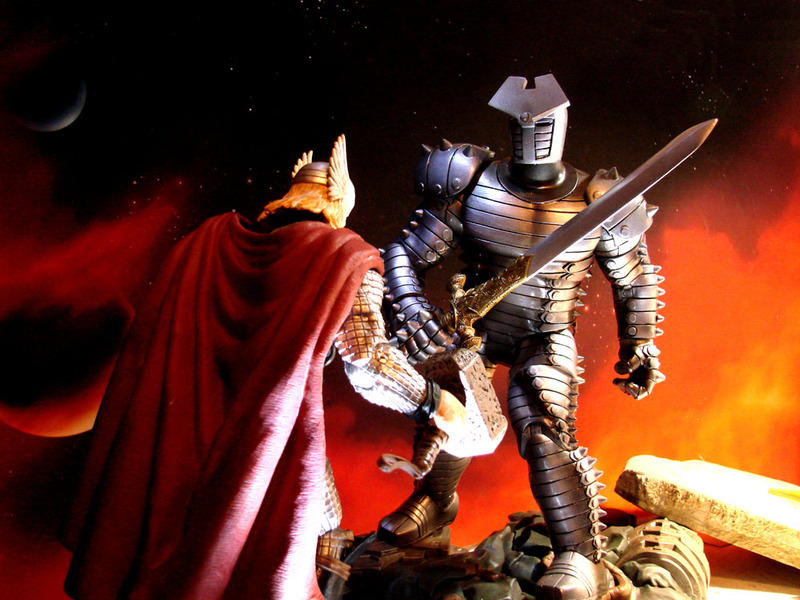 Both were sculpted by Gentle Giant Studios. – Groot features approximately 16 points of articulation and measures approximately 10 inches tall. He also comes with a piece of the diorama base. He was sculpted by Gentle Giant Studios. Each figure set includes a sculpted diorama piece, which, when connected, forms a larger environment that measures 16 inches long. Each of the four sets come packaged in the trademark Select display packaging, with side-panel artwork for shelf reference. Pre-orders open on January 30th at MarvelShop.com, and on February 27th at DisneyStore.com. 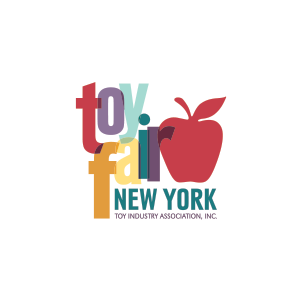 Figures will ship to customers and to Disney Store locations on or around March 13. 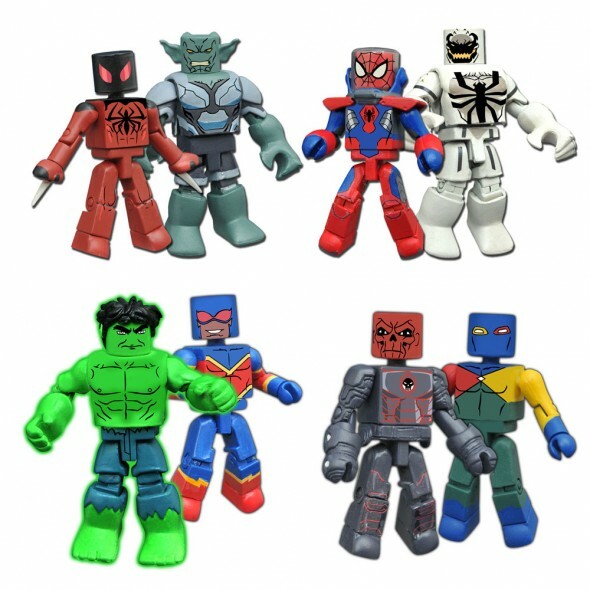 The Guardians of the Galaxy join the roster of exclusive Marvel Select figures at the Marvel Shop and Disney Store, including Spectacular Spider-Man, Masked Doctor Strange, Unmasked Captain America, Winter Soldier, Black Panther, Hulkbuster Iron Man, Agent Venom, Unleashed Hulk and Bleeding Edge Iron Man.